Computer chip giant Intel Corp. intends to muscle into the fast-growing market for self-driving vehicles. At the Los Angeles auto show on Tuesday, CEO Brian Krzanich said Intel Capital intended to invest more than $250 million over the next two years to develop technology for autonomous vehicles. Intel, which traditionally has not been a major automotive supplier, has been expanding its presence in recent years. Over the past 12 months, the company says it has booked contracts with a variety of automakers worth $1 billion. Customers include BMW, Daimler, Hyundai, Infiniti, Jaguar, Kia, Lexus, Mini, Rolls-Royce, Toyota, Tesla and others. And in July, Intel announced that it was teaming with BMW and Mobileye to develop self-driving system for the iNext, which will replace the 7-series sedan as BMW's flagship. 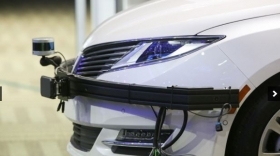 The three companies will make their technology available to other carmakers, and projected that fully automated vehicles would be commercially available by 2021. Intel’s announcement portends an expanding battle among chipmakers in the market for autonomous vehicles. Last month, Qualcomm announced the acquisition of NXP Semiconductors -- the auto industry's largest chipmaker -- for $38.5 billion. Nvidia, a major producer of chips for computer games, also has established a powerful niche in the market.